Case Western Reserve University is an internationally recognized research university that attracts bright, ambitious students from around the world. Case Western Reserve consistently ranks among U.S. News & World Report’s top universities in the United States and around the world and also rates among the top 100 universities in the world by the Times Higher Education Supplement. Cleveland, Ohio, located about midway between New York City and Chicago, is a major hub of activity in health care, biotechnology, business, and culture. Cleveland Clinic, rated the second-best hospital in the country; the Cleveland Orchestra, one of the world’s premier symphonies; and the Rock and Roll Hall of Fame and Museum are just a few of the cultural and intellectual institutions that call Cleveland home. Type of SCHOOL: Case Western Reserve University is a nationally renowned private, coeducational, residential, urban research university with a proven record for student success. Size of Campus: Case Western Reserve sits on 550 park-like acres in Cleveland’s University Circle, one of the nation’s most culturally robust communities. Number of Students: Case Western Reserve is home to 5,267 undergraduate students and 6,229 graduate and professional students; one in five undergraduates is a citizen of a country other than the United States. Number of Faculty: The student-faculty ratio is a very low 11:1. Faculty members, not graduate students, teach 88% of all University credit hours. Colleges, Programs, and Degrees: Case Western Reserve offers more than 100 academic programs in the Schools of Engineering, Management, and Nursing as well as the College of Arts and Sciences. Geographic Diversity: Undergraduate students represent all 50 states and are citizens of 91 countries. International Student Services: Visit students.case.edu/international for more information. Financial Aid: All first-year applicants are considered for scholarships; some scholarships require an additional application or audition. Need-based financial aid and scholarships are available to international students; $6.3 million in assistance was offered to international students admitted to the Class of 2022. Test Score Requirements: We accept self-reported SAT or ACT scores. Non-native English speakers must demonstrate language proficiency with adequate scores on the TOEFL, IELTS, or PTE Academic. Language requirements can be waived for students who earn sufficient scores on the SAT Critical Reading or ACT English and for students who have attended a school where the language of instruction is English for two years by the time of graduation. Case Western Reserve University students are serious about success, and every facet of their college experience is geared toward equipping them with the knowledge and skills that will allow them to achieve their goals. 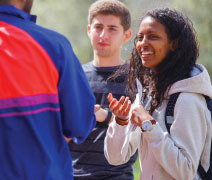 From rigorous course work—spanning arts, engineering, humanities, management, natural sciences, nursing, and social and behavioral sciences—to hands-on learning experiences and vibrant city living, a Case Western Reserve education prepares students to become distinguished academics, savvy professionals, and productive global citizens. Case Western Reserve offers more than 100 academic programs—including a Biomedical Engineering program ranked #15 in America and an International Business program ranked among the top 15—all of which weave intense classroom theory with hands-on application in a host of real-world settings. Our single-door admission policy allows students the freedom to dedicate themselves to all their interests, building their capacities in areas as diverse as Contemporary Dance and Accounting or Political Science and Civil Engineering. All CWRU undergrads benefit from the common curriculum, SAGES (Seminar Approach to General Education and Scholarship). SAGES courses feature small interdisciplinary seminars that connect students to faculty and the world-class institutions in Case Western Reserve’s University Circle neighborhood. SAGES classes focus on sharpening the written and oral communication skills that ensure the success of students’ ideas—equipping them with the tools to become lifelong leaders. 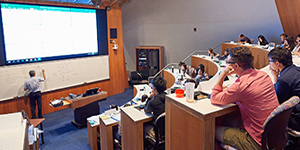 A CWRU education is founded on the belief that learning is best accomplished through a blending of theory and practice, and 98% of students participate in at least one form of experiential learning during their undergraduate careers at Case Western Reserve. They put their classroom knowledge to use in clinicals, cooperative education, education abroad, internships, practica, research, and service learning. The chance to be part of the investigative process is one of the hallmarks of the Case Western Reserve experience, and beginning as early as their first semester on campus, undergraduates of all academic interests have the chance to play important roles in carrying out CWRU’s research mission. Often their hard work is rewarded when, as undergraduates, they become published authors—their results reported in some of the country’s most prized academic journals. 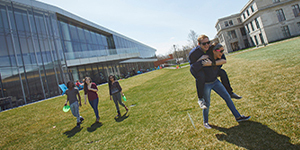 CWRU students are not only active members of the campus community; they’re involved throughout Greater Cleveland, across the country, and around the world. Opportunities for community service can be found in classes, student groups, study abroad programs, internships, co-ops, and practica. Students can volunteer at any of the three nearby hospitals, tutor inner-city students, assist local nonprofit organizations with their finances, tackle technical projects that better the community, and much more. Case Western Reserve is the centerpiece of Cleveland’s University Circle—the most culturally robust community in America. The area is home to more than 40 prominent artistic, cultural, educational, health, and human service institutions. Partnerships with these neighbors—including the Cleveland Museum of Art, Cleveland Museum of Natural History, Cleveland Institute of Music, and Cleveland Institute of Art—offer students unparalleled access to invaluable educational resources. Future health care leaders also benefit greatly from the University’s partnerships with nearby medical facilities, including University Hospitals, which sits adjacent to our campus. Less than one mile away is Cleveland Clinic, consistently ranked among the top five hospitals in the nation. Less than five miles away and easily accessible by public transportation, downtown Cleveland is the headquarters of KeyBank, Eaton, Sherwin-Williams, and more and is celebrated for its world-renowned health care institutions, burgeoning culinary scene, and four professional sports teams: the Cleveland Indians, Browns, Cavaliers, and Monsters. The attractions of Cleveland and University Circle are just a short walk or ride away, and students can easily access all of the area’s cultural and recreational attractions via public transportation, to which undergraduates are granted unlimited access. Case Western Reserve students enjoy more than 200 student organizations and activities to choose from. They can play out their potential with a Spartan athletic team, make their voices heard in a student government body, or soak up the spotlight in a performing arts group. There are academic and community service groups as well as 37 religious, international, and cultural organizations. With nearly 80% of students living on campus, there are plenty of folks ready to join in the fun. Case Western Reserve students graduate ready to tackle the next phase of their lives, whether that means landing a spot in a top-ranked graduate or professional program or securing employment in their field upon graduation. Within three months of graduation, 94% of recent graduates are accepted to graduate or professional school, employed full time, or pursuing personal or educational interests such as community service or travel.